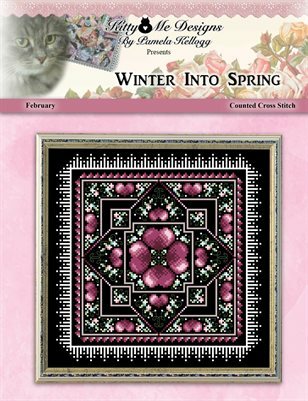 Winter Into Spring February Cross Stitch pattern. Originally designed as a 4 part bellpull and as a mystery stitch-along project, the Winter Into Spring series of counted cross stitch patterns is now available again! Each design is 121 stitches square. On 28 count evenweave over 2 fabric threads (or 14 count Aida) the finished stitched area of each design measures 8 5/8 inches square. These love designs are now sold separately. They can stitched as a bellpull, or one large design or sewn into individual pillows or framed pieces. Uses DMC 6 strand embroidery floss, 1 Kreinik #4 Braid per design and Mill Hill beads. Large print/easy to read black and white symbol charts with colored backstitching.